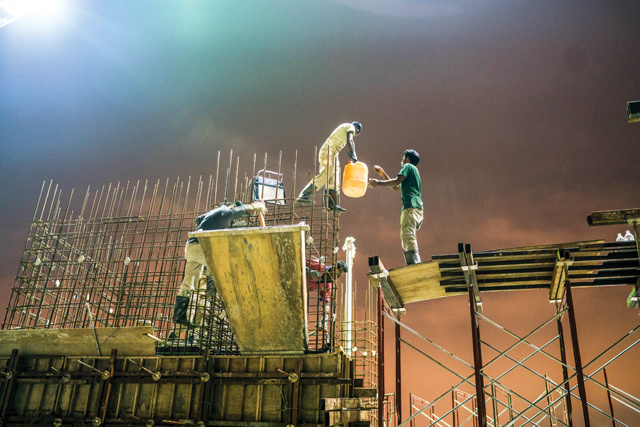 BANGLADESH TO BANGSAR:Abdul Hossain works in this construction site in Kuala Lumpur . The picture of him with his mother Nurjahan Begum and wife Amena Akter was taken when he came home to Comilla to get married last year. Amena says the money he'll send home will help, but he worries about his dangerous job in Malaysia. 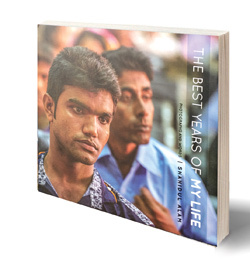 Bangladeshi photographer Shahidul Alam’s book, The Best Years of My Life, helps us see through the numbing numbers about overseas migrant workers. The images humanise their hopes and hardships. The statistics are staggering: an estimated 3 million Bangladeshi workers (95 per cent of them men) work in the Gulf, Malaysia and Europe, sending home $14 billion every year, making this a major source of revenue for the country of 161 million. Although the earnings figures for Nepal are much less, the $6 billion in annual remittances sent home by an estimated 3 million Nepalis abroad form a much larger proportion of our population and economy – making the revenue equivalent to nearly a third of Nepal’s GDP. The analysis of the macro trends of our migrant economies makes us forget the individual stories of the foot soldiers of this mass movement of people for work abroad. Being a world-class photographer with a social conscience, Shahidul Alam is perfectly placed to tell the stories of his compatriots, and has done so with expected sensitivity and empathy – focusing on the single biggest reason migrants migrate: to change their destiny. Mamun arrives in Kuala Lumpur airport with other Bangladeshi workers who are herded to a different part of the terminal meant for migrant workers. Later, his passport and money were stolen by another Bangladeshi worker, he was extorted by his recruiter and did not earn the salary promised. Alam meets Bangladeshi migrant workers like Ali Hossain, who sells roses at intersections along the boulevards of Paris, Abdul Hossain (pictured above), who works in a Malaysian construction site, and follows Mamun as he flies out of Dhaka for the first time to a job the middleman promised in Malaysia. He meets officials at the Bangladesh High Commission in Kuala Lumpur, profiles activist Glorene Das, whose organisation Tanaganita helps workers in trouble in Malaysia, and even gets an interview with former prime minister Mahathir Mohamad. 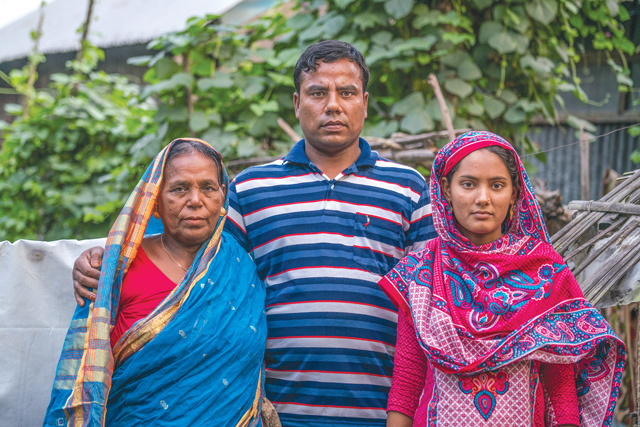 The pictures, words, tales of exploitation by agents, of trafficking, and of hopes for a better life are all wrenchingly familiar – we hear them all the time here about Nepali migrant workers. It is the universal story of the rich and powerful taking advantage of the desperately poor and vulnerable. They can cheat and abuse with impunity because of weak and corrupt governments who are often in cahoots with the recruiting agencies. Even the Bangla word for manpower middlemen is the same as in Nepal: dalal. 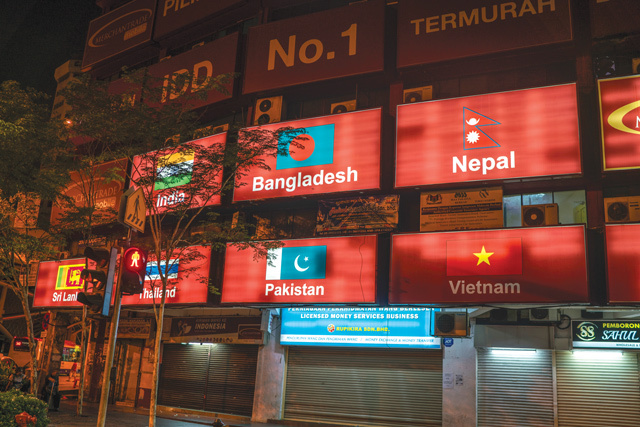 Virtually all migrant workers from Nepal, Bangladesh and Pakistan in Malaysia use WhatsApp, Viber or Facebook, but telecom companies employ street vendors at the Bengali Market in Kuala Lumpur to offer special SIM card deals for migrant workers. In Paris, Ali Hossain stops awhile to talk to Alam while sprinkling water on the roses he has parked in a bucket in his bathroom before heading out to the streets. ‘He didn’t mind the job … or that he was giving away the best years of his life to secure a future for his family. He didn’t bear a grudge, but it hurt,’ Alam writes. The photographs in The Best Years of My Life depart from the full-blown bleeds of Alam's earlier coffee table books: he downsizes them, their smallness almost emblematic of how unimportantly everyone treats migrant workers. 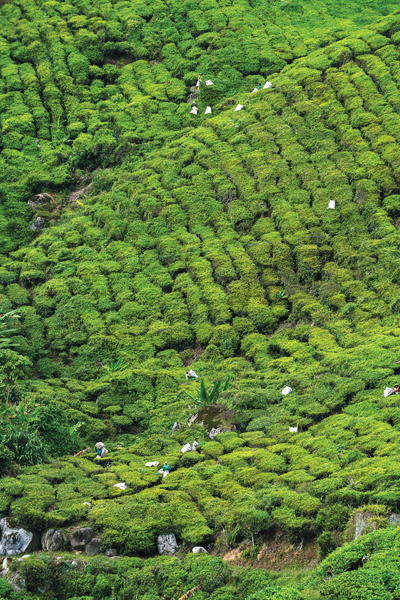 Some Bangladeshi and Nepali migrant workers are taken to the tea gardens on the Cameron Highlands straight from the airport. Although the climate is cooler, the 12-hour working days are hard and involve dirty, demeaning and dangerous work that locals are not prepared to do. If a Nepali photojournalist brought out a book, it would look and feel the same, with identical stories of overworked and underpaid workers mistreated by employers and cheated by compatriots. Only their names would be different. Nepali photographers have not forayed to the Gulf or Malaysia to bring out a book like this yet. However, there have been powerful, award-winning documentaries, notably In Search of the Riyal and Saving Dolma by director Kesang Tseten. The plight of migrant workers is featured in many recently released Nepali language novels, and two non-fiction works in the past year: Devendra Bhattarai’s Registan Diary and Kahar by Janak Raj Sapkota. The findings of a new study on the remittance economy hint that migration, besides contributing to the economy, has facilitated broader social and political changes in Nepal that have affected local politics and elections. Despite remittance being the mainstay of Nepal’s economy, few researchers have looked at how labour migration is changing social and political dynamics at the local level, and the impact of remittance on social structures, political participation and contestation. 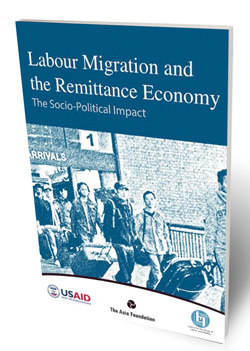 Labor Migration and the Remittance Economy is published by the Centre for the Study of Labour and Migration for The Asia Foundation and USAID, and clarifies that the rise in political autonomy doesn’t have significant impact on voting patterns. The study looks at how the migration experience abroad can influence how politics is conceived by migrants and family members at home. “Due to the changes in political behaviour, an increasing proportion of left-behind members and returnees are voting over the years,” the report says. Although political disenchantment is one of the push factors for migration, a significant number of returnees participate in political parties. Only 9.9 per cent of prospective migrants were engaged in political parties whereas 13 per cent of returnees were engaged in parties, according to the survey. This could mean that migration has played an important role in providing migrant households with the economic means to consolidate changes in relations between the poor and landless with landed patrons. “The change has been achieved by reducing the dependency of the poor and landless on their landlords for needs such as land, loans and employment,” it explains. Interviews were conducted in 401 households in Panchthar, Dhanusa, Nawalparasi, Kaski and Kailali in 2016 with returnees, left-behind family members, prospective migrants and non-migrants. Questions covered the relationship between political parties and voters, gender, differences in political aspirations between the younger and older cohorts and the impact of migration on local institutions. The study suggests that efforts like better protection of migration workers at home and abroad, safer working conditions, easier access to credit and enhanced investment opportunities for remittance will amplify the benefits of migration.